I’ve spent a few months filling my gaming time with newer games, especially MMOs and deeply involved action RPGs. While these are games I love playing, they often require a lot of time investment and often lack the ability to pause. That becomes a problem when you’re looking at an hour or two every other night, with any other free time necessitating regular stops to look after a child. This led me to go back in a time a bit, to find something I could play a bit more idly, and something that I could drop at a moment’s notice. It led to me going back to some older turn-based RPGs, especially those I had beaten before. 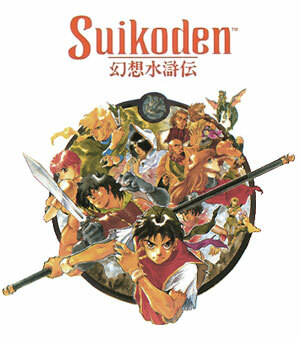 It’s been over a decade since I last played the original Suikoden game, and after diving back in I started to realize what made the series so special. Konami, being a pretty awful company by most accounts, is unlikely to circle back to the series. However, it had a five game run with a handful of spin-offs and I’m rediscovering how well they hold up. I plan to burn through the series over the next few months (including the fourth entry, which I’ve never put significant time into) and having completed the first game, it’s a good opportunity to convince others to check out a classic series. We’ll start here with the first game, which is available on the PSN for PS3 and PSP/Vita as you read this. Let’s get this out of the way- Suikoden is the first game in a series, and it shows. It had not yet refined the UI, it contained a lot of inconvenient gameplay mechanics, the story was mostly rote and the dry translation did little to help. Despite these shortcomings, the series had a number of innovations that have yet to be improved upon, making it a worthwhile visit based not just on historical value, but also on pure entertainment value. You play as Tir McDohl—or more accurately, YOURNAMEHERE McDohl, but roll with it—the son of an General in the Scarlet Moon Empire. Left in charge while his father is off being a General, Tir soon realizes he’s in a 90’s video game empire and promptly runs off to the local rebel army, the Liberation Army, dedicated to overthrowing a predictably despotic ruler. While all this is expected, the game quickly separates itself. Your character is not the leader of a small band of adventurers, but the leader of an entire army. You are divinely tasked with recruiting the 108 unique people, the Stars of Destiny, in your fight against tyranny. While some of these characters are automatically recruited, many are optional and some require lengthy recruiting processes. Gathering the 108 Stars of Destiny is a minigame in itself, often requiring a high attention to detail and a fair amount of legwork. Many of these recruits live in your upgradable castle, providing services such as running shops, building elevators, installing hot springs, or running gambling minigames. A large number of them, however, are party members capable of joining you in battle. This is where the first game really impressed me and felt ahead of its time. With over 70 possible party members, it would be easy for many characters to feel samey, but the game does a few things to encourage you to try new members. First, your party size is six characters. While this can seem unwieldy to anyone who has ever played a turn-based RPG before, the game mitigates this by including a useful auto-fight mechanic. The game also allows multiple characters to act at once, lowering the animation time of such large party battles. If a character defeats an enemy, the next character will not wait for the animation to finish before moving on and will leap forward alongside their ally. It’s small, but appreciated. And it’s easy to bring in a new character, due to a rubber-band leveling system. Every level takes 1000 experience points to reach, but the experience you receive scales based on the enemies you fight. What this practically means is that, if you have a level 40 party and add in a level 10 character, that level 10 is going to pick up multiple levels from each fight until they catch up. Equipment is less of a hassle to manage as well, as each character has a single weapon that is sharpened by blacksmiths- that means some characters can have very unique weapons, and there is a little less juggling of equipment between characters. That’s not to say none, however, and that’s one of the rougher points of the first game. Each character has a very finite inventory space, which includes any armor they have equipped, and there is not party inventory. This means you’ll spend some time juggling items to try to pick up something from a dungeon, and you’ll have an interesting time outfitting new party members with armor. Thankfully, money flows pretty well and you can often pull together what you need to outfit new characters. Adding to the temptation to try new characters are Unite Attacks. These are unique attacks performed by more than one party member at a time, from 2 all the way up to 5 at a time. These are the show-stoppers in terms of animation, and they usually represent some kind of bond between the characters. It’s fun to find new attacks, and there are plenty to find in the game.The game often fills one or two of your open spots with required characters, leading you to try out party members associated with those required characters. It’s low investment to bring in those characters due to the leveling system, and the lack of grinding is complimented well by the fast pace. That’s not all there is to see, however. The game introduces two other kinds of battles- one on one duels, and large-scale army battles. These systems would see improvement over the series, but even in their basic forms here they represent an interesting pace change. Duels are used to highlight important plot points, and utilize a rock-paper-scissors system wherein you can predict the opponent’s next action based on what they say before a round. These are quick, fun diversions with a dynamic camera to capture things a little more interestingly. Army battles also use a rock-paper-scissors system, but you gain skills based on your recruited Stars of Destiny. Ninjas can predict enemy movements, merchants can attempt to sway enemy combatants, and your warrior units are all unique attackers that can only be used once per battle. These are pretty easy, but they do introduce perma-death to the gameplay. If a character dies in an army battle, they are dead for good. You cannot recruit all 108 Stars of Destiny, missing out on some end-game events, and they will not get a slide in the epilogue. It’s enough to cause a reset if you really botch a move and get a character killed. The quest is fairly standard, but the world is interesting and leaves room for expansion. As you play, you really get the feeling there is a bigger world outside of the events you are involved in. You never get an airship and see the edge of the world—you’re mostly restricted to one landmass. You hear of other lands beyond the area here, and for good reason. Every Suikoden game takes place in the same universe, and you’ll often recruit characters from previous games later in the series. Old enemies can become friends, and vice versa, and the history of the world builds up over time. The series is based around the 27 True Runes, magical MacGuffins that created the world and many of the supernatural elements therein. Smaller versions of these runes are used for standard magic, but any time a character has a True Rune—including your main character in each game—world-changing events tend to follow. These, along with the huge cast of likable characters, are what will bring most people back to the series. The game is not without its flaws. It’s an early PSOne game, and it plays like one. The graphics are stiff 2d sprites with relatively low animation, and the menus are not exactly intuitive. Managing inventories can be messy, and it has a few oddities of early CD based games: music that cuts out during loading, muddy music quality, and longer load times than expected given the graphical quality. The music is hit and miss, with a good few standout tunes among odd CD samples and often generic dungeon music. The duels and army battles, while entertaining diversions, lack the depth to really stand alone, and the core story is straightforward and regularly cliched. However, the world built here is unique and forms an important basis for the games to come. And for what it’s worth, I had a genuinely good time revisiting this game as I hunted down the 108 Stars of Destiny and tried out each warrior in battle. Exploring my castle after each upgrade was a treat, and the recruits that added unique functionality within the castle were always a blast to try out. Despite all the content, the game is pretty short too. My final time after recruiting everyone was just over the 20 hour mark, though I imagine a fresh play through could expect another 5 hours. For an RPG, the game is tight with little filler. Every plot point is memorable, and the game never feels like it’s stalling for time. You can pick it up on the PSN for under 10 bucks, and it’s well worth the money and time invested. It’s incredibly fun, surprisingly unique, and sometimes, emotionally powerful. All in all, not bad for a game nearing 20 years old. I’m just now realizing that I’ve hired interns younger than Suikoden. I’ll end this here as I go sit in my chair and ponder the ruthlessness of time.